Website booking engine as seen on a laptop or pc. The booking engine adapts to the type and size of the screen whether it Desktop, Laptop, Tablet or Smartphone. Guests can select the room(s) they require, click 'book' and then enter credit card details. Alternatively, sign up for our own Blue Circle Club or use Apple Pay, Google Pay or Microsoft Pay to simplify & speed up the booking process. 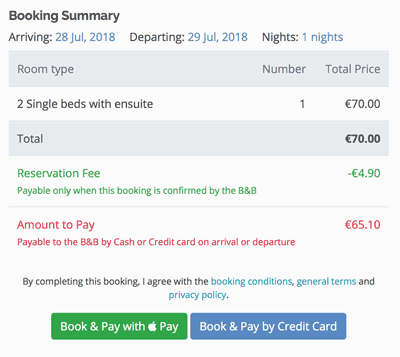 The booking details then appear in the B&Bs dashboard but ONLY if the guest has used a valid credit card. Stringent checks are carried out to minimise losses to B&B Owners through credit card fraud and ensure the card is not stolen or has insufficient funds. NOTE! These days credit card numbers are NEVER be passed to a B&B Owner for processing. The guest's credit card details for any booking, sit in a highly secure repository and a B&B Owner simply clicks a button that allows our payment processor (Stripe) to automatically charge the card, without ever seeing the actual credit card number. 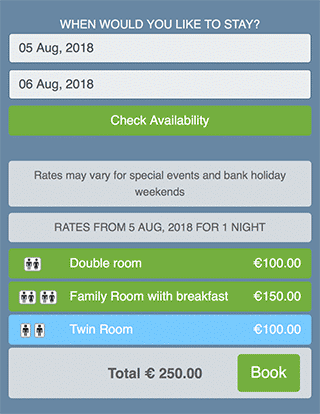 The number of people using a smartphone to book their accommodation increased to 52% during 2018. With the introduction of Microsoft, Apple and Google Pay systems this has now become a whole lot easier.